Venice, 1609. Galileo Galilei is a mathematician and teacher, earning money by tutoring the sons of nobles and making various inventions, such as an impressive military compass that can improve the accuracy of artillery. Unfortunately, although ferociously intelligent Galileo lacks practical experience: his compass is too complicated to use effectively in the chaos of battle and he sells only a few. His debts mount and the monetary demands on him of his family continue to grow. In the midst of this chaos Galileo learns of the development in Northern Europe of lenses which allow distant objects to be seen more closely. He quickly becomes fascinated and makes improvements to the idea, eventually creating a device he calls a telescope, which he uses to make studies of the stars and the Moon, which is a big hit. His discovery of four moons circling Jupiter causes shockwaves in contemporary science, but he brings himself to the attention of the Church in Rome when he uses the motion of the Jovian moons to advance the heretical notion of Copernicanism, which states that the Sun is the centre of the universe and the planets orbit it, in opposition to Church doctrine that the Earth is the centre of everything. As the years pass Galileo finds his support for Copernicanism makes him many enemies, and comes dangerously close to having him burned for heresy. As he struggles to reconcile faith and science and so better understand the works of God, he also suffers sudden collapses which last for several hours. During these periods he has a strange recurring dream, in which he is taken to the Jovian moons in the year 3020 and there asked to help mediate a dispute between different scientific factions arguing over whether to contact a new lifeform discovered deep in the oceans of Europa. Galileo also comes to know his own future and his understanding of the universe is vastly expanded by his exposure to the ideas of Newton, Einstein, Hawking and more, but each time his return to the real world is accompanied by a loss of memory of these experiences. But in his mind one thing remains clear, that in the 1630s he will anger the Pope one time too many and burn on the stake. Can this fate be averted? Galileo's Dream is an ambitious novel by Kim Stanley Robinson, author of such significant works of SF as The Mars Trilogy and The Years of Rice and Salt. It mixes a biography of Galileo, sticking fairly closely to the events of his life, with an SF story set a thousand years hence amidst the moons of Jupiter. Even this is curiously old-fashioned, told as a planetary romance rather than a rigorous SF tale of the type you would more normally expect from this author who made his name in hard SF. This decision gives an interesting dream-like quality to the future-set sequences (hence the book's name) and helps integrate them better into the historical narrative. The story is overall fascinating, even to those familiar with Galileo's life story. His love and support for his eldest daughter, whom he has to commit to a convent since she was born out of wedlock, forms an important part of the story, as do his various friendships with key and not-so-key figures of the age. Robinson's portrayal of the maestro is excellent, with Galileo coming across as a wayward genius, not interested in politics or practicalities and sometimes running afoul of political currents a more savvy person could have steered around. The importance of rhetoric and semantics in 17th Century life is also described, Galileo being able to work on the Copernican model of the universe despite the Pope's displeasure simply by saying "It's just a hypothetical thought-experiment,". 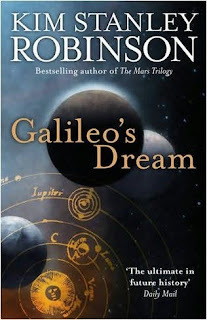 In short, Robinson's portrayal of Galileo is masterfully done, and makes the reader more interested in looking up the great man's life himself. The depiction of 17th Century Venice, Florence and Rome is also very well-done. The futuristic story is intriguing, but somewhat cold and remote. It is hard to really get into the mindsets of the characters there, although this does enable the reader to sympathise more with Galileo's bewilderment as these people and their world. However, the future sequences do allow for a more interesting examination of Galileo's beliefs and character than perhaps could otherwise be achieved. The emotional core of the story remains events in the 17th Century, which are engrossing. However, the slower pace and the intrusions of the 31st Century storyline may make the book less interesting to some readers. Galileo's Dream (****) is a thought-provoking, genuinely interesting SF novel which illuminates the life of one of the most important men in the history of science. It is a slow-paced work, with little in the way of personal jeopardy or danger (until the end), but the relaxed unfolding of the story and the novel's fresh take on a tale that is already known makes it all the more engrossing. The novel will be published on 6 August in the UK and on 29 December in the USA. Adam - have you read the 'Mars' trilogy? If so what did you think? Fifteen years ago, yup, so that's another one due for a re-read. I thought RED MARS was very good, a mix of hard SF with more dramatic storyline moments. GREEN and BLUE MARS didn't have anything like the same level of compelling storytelling but came across more as textbooks on the sociology of a Mars colony and how its attitudes towards religion and environmentalism would develop. It was fascinating but a bit dry. Yup, that's close to what I've heard from others. Gotta read that trilogy one of these days though.